The proofreading project started in late September has just completed, so Frank Tousey’s handbook, How to Solve Conundrums, is now available for the world as a Project Gutenberg eBook. 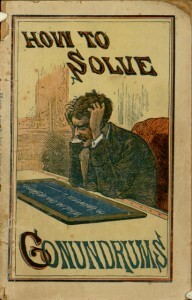 As mentioned when the project went into proofreading, this book doesn’t actually tell you how to do anything at all; it just consists of a series of puns and riddles, which once were popularly known as conundrums. What is the difference between homicide and pig-sticking? One is assault with intent to kill, the other a kill with intent to salt. What is the height of folly? Spending your last dollar on a purse! While these sorts of jokes are unlikely to change your life, the book does shed some interesting light on the practices of publisher Frank Tousey, who produced inexpensive handbooks on a wide range of topics. The frequent duplication of jokes (and the occasional omission of punchlines) suggests a less-than-careful editorial process. The presence of many jokes about British politics suggests that at least some of the text was pirated from the other side of the Atlantic. It might be quite interesting to try to determine the paths these jokes followed from publication to publication; as more content comes online, this may eventually become an achievable project. For now, if you want to start by reading Tousey’s offering, you can find it at Project Gutenberg for online reading and download to a variety of popular devices.